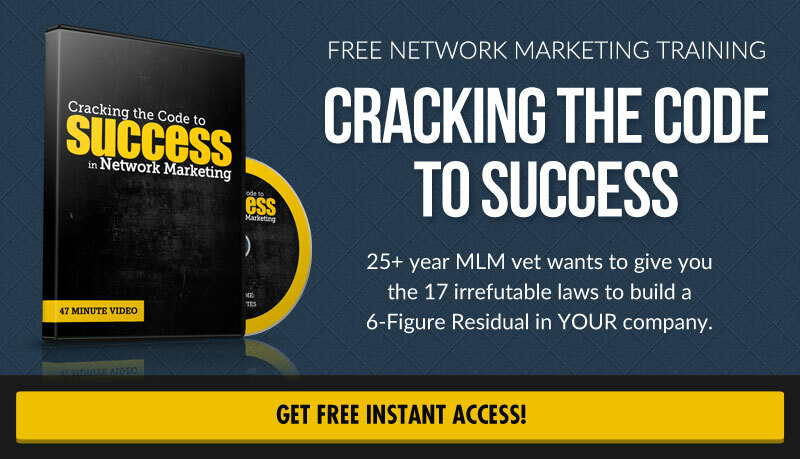 Prospecting is one of the most crucial skills to develop as a home business owner. Without targeted leads or qualified people to talk to about your business, you won’t get very far. Yet it is also one of the most feared subjects since for most people it means getting way out of their comfort zone. Prospecting doesn’t have to scary, though, and it doesn’t have to be difficult. In fact, the more you practice this skill and get into a flow with it, you might find you actually ENJOY the process. So let’s take some pressure of prospecting and go over few simple tips you can start applying TODAY in order to create better relationships and sign up more people into your business. Fear is one of the biggest dream killers. It stops so many people from taking ANY action at all that they never even stand a chance for success. The made-up stories in our heads about what MIGHT happen or possibly go wrong keep many from even trying. But when you really think of the worst possible outcome, you might stop and realize it’s not so scary after all. So what if a few people judge you or hang up on the phone when you try to follow up with them? In all honesty, whose life does that affect more? THEIRS! No one’s opinion of you can change who you are or stop you from your dreams. Another thing to keep in mind is that as you develop your prospecting skills and practice more, your confidence will increase as well, therefore removing more layers of fear and doubt. Each time you “survive” another prospecting conversation, you can take a deep breath and use what you learned from that conversation to make your next one even better! How can you know if your product or service is a fit for someone if you don’t first ask some questions? This is where many people go wrong. Even if you believe your product is the best thing out there and something that “everybody needs”, there will still be plenty of people who have no interest in it whatsoever. 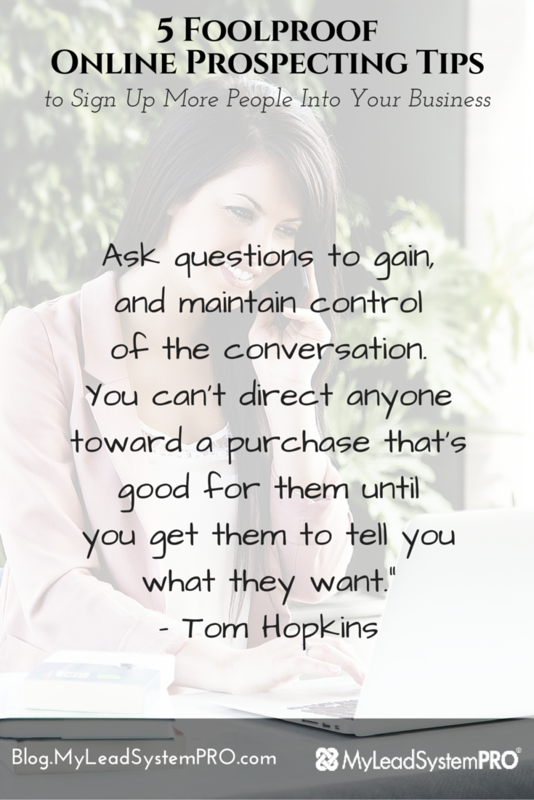 This is why asking questions and truly understanding a person’s needs and wants is such an important part of the prospecting puzzle. At the end of the day, people are going to make their own buying decisions regardless of how strongly another person thinks they need something. You can help guide them to that decision (if it's a fit) by asking questions that dig deeper and reveal any pain points. If what you have to offer is a solution for that person’s pain point, it will make their decision to buy from you a no-brainer! This is a big one! When you first start your home business journey and generate some leads, it’s so easy to become emotionally attached to those first few people signing up. The problem is if you enter a prospecting conversation with the intention of NEEDING to make the sale, you completely limit yourself from actually helping that person. The reality is more people will say NO than yes to your business. Knowing this, you can mentally equip yourself for the journey. Rather than getting upset or feeling rejected when a person says they’re not interested, just thank them for the time, wish them well, keep the friendship, and move on. Don’t worry about trying to convince or prove yourself or your business to anyone. You will face so much more heartache if you are too emotionally attached to the results. Instead, focus on the process of sifting and sorting as you meet more and more people. Through this process, you will find that some people are a great fit for your business while others may just be a better fit as friends. One big clue that will let you know if you are being too emotionally attached to your results is how you treat a prospect when they tell you no. If you find yourself getting hurt and no longer wanting to engage in that conversation, then you know you’ve taken it too personally and went into the conversation with the wrong intentions. Another thing to keep in mind is that just because a person is not interested right NOW doesn’t mean they won’t be in the future. Nurture those relationships as friends while you continue to build your business. You never know if somewhere down the line that friendship will blossom into a wonderful business relationship. Keep your mind and heart open. The great Jim Rohn said, “Even if you are new in sales, you can make up in numbers what you lack in skills.” What this means is that as you are learning and developing these new prospecting skills, simply just talk to MORE people. There are actually two major benefits to this strategy. The first is that it gives you a ton of practice! The more people you talk to and expose to your business and even the more rejection that you face, the better you will get. You will learn so much from your conversations, which in turn will create more confidence in your prospecting abilities. The more confidence you have, the better you will get with this skill. The second thing about the law of averages is that with enough time and consistency, you will eventually see results. Keep plugging away and keep your lead pipeline full at all times. You will gain so much confidence and posture when you do this, which is a huge attractor factor for your prospect. It’s much easier to detach yourself from the outcome when you have plenty of people to talk to each day. One of the mistakes many of us make when we first start a home business is we simply TALK TOO MUCH when we could instead leverage the tools of professionals who have already done the work for us. Your company pays a lot of money to test the best marketing materials and hire the best talent to help you grow your business. Your job is to UTILIZE it. Think of your job as “Show and Tell”. Take what you’re given and share it with others enthusiastically. This actually takes away a ton of pressure for you! Rather than trying to memorize or learn every single fact to share with a prospect, simply focus on getting to know them more, asking questions, and providing solutions. If you place more emphasis on asking questions and then simply POINTING people to the best resources you have available to help them, it will get you better results and remove a ton of stress and fear. Talk less, share more! That sums up our 5 prospecting tips to help you rock out your business this week and close more sales. Now we’d love to hear from YOU. What is your best prospecting tip that helped transform your business results? Prospecting is one of the most crucial skills as a home business owner. Let's face it…Without qualified people to talk to about your business, you won’t get very far will you? Yet it's one of the most feared subjects in our industry. You truly can't have success without prospecting. 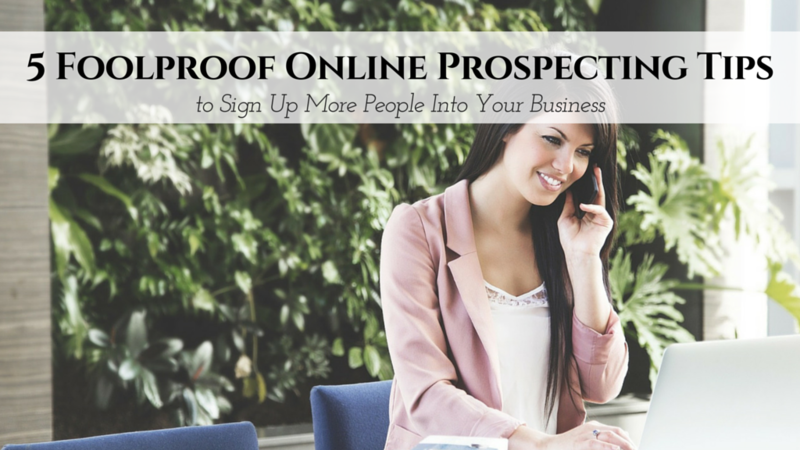 Click Here for 5 Foolproof Online Prospecting Tips to Sign Up More People Into YOUR Biz! Great post guys…your tips are simple and easy to follow. I definitely plan to give this a shot the next time I’m conversing with a prospect. 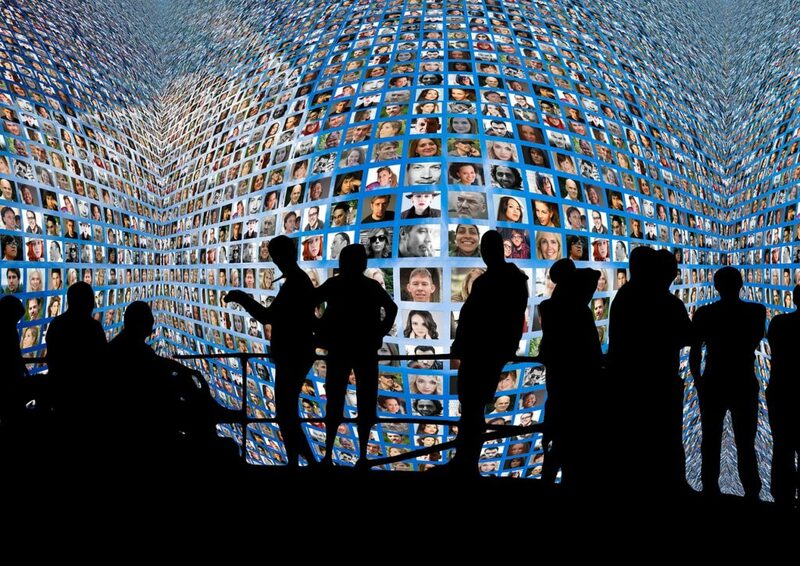 how can you prospect,without a personal face to face connection?